Is it just me or did this week drag? Man it went slow but we were extremely busy here at school. We had our 2nd picture day on Monday. No worries if you did not get your picture taken yet because on December 3rd 2018 we will have our last picture day. Anyone who did not get their pictures taken and paid for a package will have them done on December 3rd. Reminders will go out before the day. We are now 5 days until Halloween. Mooohhoooohahahahaaaaa……Do you have your costume yet? Everyone at Halsey will be dressing up for the occasion so we hope you will be too. Have you signed up for Shoparoo? We need your support and its hassle free fund raising!!! Its a lot of fun too because we can compete with each other and see who raises the most money for the school. Maybe we can come up with a prize for the top fund raisers as well. Hunter Scores have been sent to be verified. Parent Teacher Conferences will take place on Tuesday, November 27th, 2018. 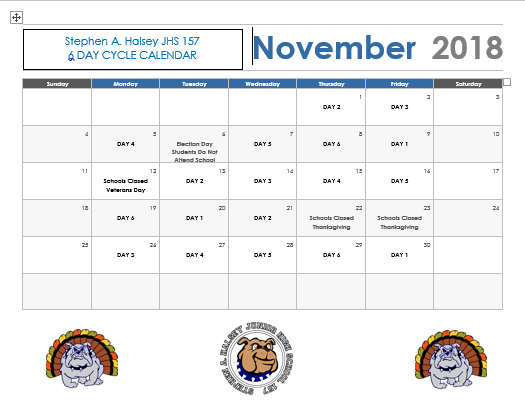 Click Below to download the November 2018 6 Day Cycle Calendar to enlarge and print. This year Halsey had the amazing opportunity to participate in the John Lennon Educational Tour Bus once again. The John Lennon Educational Tour Bus presented by OWC is a non-profit 501(c)(3) state-of-the-art mobile audio and HD video recording and production facility. In its 21st year, with the very newest technology and gear, the Bus continues to be dedicated to providing young people with tours of the studios, participation in free digital media production workshops, and the production of giant peace signs. 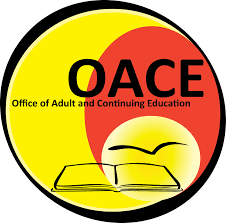 The Office of Adult and Continuing Education’s mission is to empower adults in their roles as parents, family members, workers and community members. We promote lifelong learning and the development of problem solving skills through a continuum of services, including Adult Basic Education, English for Speakers of other Languages, High School Equivalency, and Career & Technical Education. If you want to get your spirit wear before the supplies run out please contact our PTA at HalseyPTA@gmail.com DONT MISS OUT! Click the blue link to find our PTA Annual Appeal letter, hard copies were sent home with your children last week. All through the month of October, Halsey will be collecting donations of BRAND NEW socks, hats, mittens, and gloves which will be distributed to individuals and families who are homeless as well as to our veterans. Please click the picture below to enlarge it for more information!!! The New York City Department of Education is pleased to announce the fourth annual citywide Career and Technical Education (CTE) High School Fair at George Westinghouse High School on Saturday, October 27, 2018 from 9am to 2pm. The fair invites middle school students and families to explore college and career readiness as they interact with leaders and students from our over 130 Career and Technical Education schools and programs. The event will also showcase industry and college partners collaborating with CTE programs and a panel on “Bright Futures: Girls in CTE”. Forest Hills High School came to speak to our 8th grade students about their available programs. Students had the opportunity to ask questions and were treated to a performance by the very talented Forest Hills High School Chorus.